YAMAHA Model M-450 in "TRIPLE MINT" Condition. 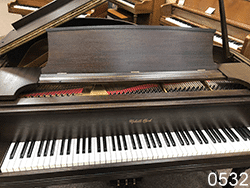 This Piano comes with Warranty and matching Bench and Plays and Looks as "NEW" A new one would retail at around $6495.00 This one can be purchased for only $2895.00 This is a very rare find and would compliment any Church Studio Or Home. Will go VERY QUICK so don't delay!! 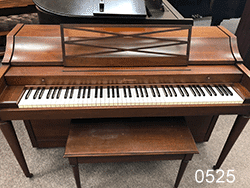 This Piano is in Excellent Condition and comes with matching Bench and Warranty. 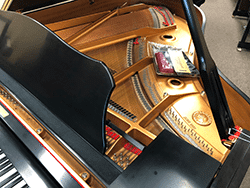 Piano Plays and sounds as "NEW" It is a 2004 Model Year. 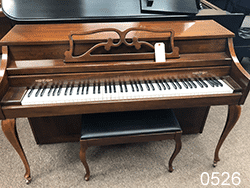 If New this Piano would Retail at around $16,995.00 This one can be purchased for only $6995.00 This Piano would be Great for Church, Studio or Home use. Pianos in this size range are hard to find Pre-Owned and will sell Very Fast so don't delay!!!! In our Lexington, KY showroom. 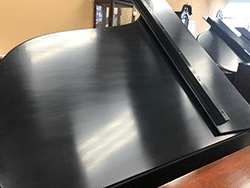 Pearl River model EU-110 Console Piano in High Polish Ebony Finish Comes with New 10 Year Warranty and Matching Bench New Retail at $5495.00 SALE PRICED AT $3495. Flawless High Polish Ebony Finish. 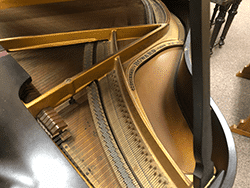 This Piano is 5'10 in size and "MADE IN JAPAN" It is Perfect in every Detail sound and finish. This would be Great for Church, Home Or Studio use. Comes with Matching Bench and a 5 Year Warranty. 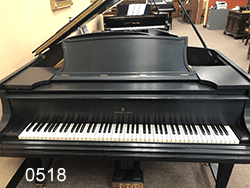 If New it would Retail at $40,000.00 This one can be Purchased for Only $13995s This Piano will sell very Quick so come in soon!!! Pearl River model EU-111 PA Console Piano in flawless Queen Ann Cherry. 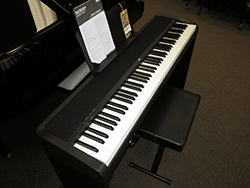 Piano comes with New 10 Year Warranty with matching Bench New Retail at $6795.00 SALE PRICED AT $3695. In "MINT" Condition Comes with matching Bench and a host of CD'S for the player unit. Also comes with warranty and hand held remote. If this piano were New it would sell in the $30,000.00 range. This one can be yours for only $14,995.00 This would make a Great Christmas Gift for the whole Family. Hurry in, Won't Last Long at this Price!! Like new Yamaha Console piano in beautiful mahogany. Comes with five year warranty and five-year full trade up. New retail price $7495 - Moving Sale Price $2695. 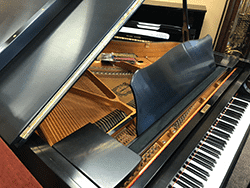 This is a Yamaha 5'FT Grand Piano MADE IN JAPAN Model GA-1 in High Polish Ebony Finish. 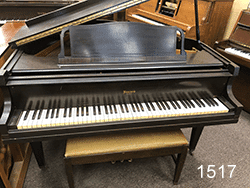 This Piano is in "EXCELLENT" Condition and Looks and plays as "NEW" This piano comes with matching Bench and was built with superb Craftsmanship for lasting Quality. If New this piano would retail at the $17,000.00 range. This one can be purchased for only $11,999.00 and comes with 5 year warranty. 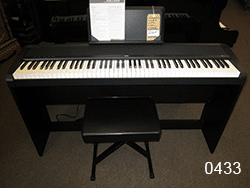 These Pianos are really hard to find these days so Hurry in!! This is a Boston Grand Piano Model GP-163 5'4 size in High Polish Mahogany. This magnificent Piano is in "TRIPLE MINT" condition and plays and looks flawless in every detail. This is a very rare find and is designed by Steinway and Sons Piano Co. Piano comes with Matching Bench and Warranty. 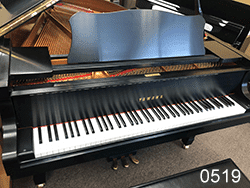 If your looking for the perfect Pre-Owned Grand Piano, Look no more, THIS IS THE ONE!!! Made in Japan. This Piano would be Great for Church, Studio or Home and will compliment even the most demanding Player. If new this instrument would retail at around 28,000.00. This one can be yours for only 15,900.00. Come in to see and play to appreciate this fine Piano. 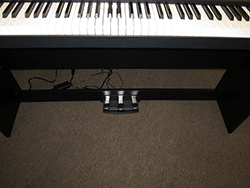 Korg digital piano retail price $895 moving sale price $429. One only! Brand new Kurzweil digital piano. Top of the line with wood keys and 9 foot Steinway Hamburg Grand sample. Brand new pearl river player Baby grand with tablet and over 500 songs built in! Retail price $24,700. Moving sale price 10,900! One year old Kawai Continental console. Flawless condition In beautiful ebony polish. New retail $5795 moving sale price $3625. Rare ivory polish Bergman baby grand in show room condition. One owner like new condition retail new is $14,000. Moving sale price 5700! Like new. Retail price $6495 moving sale price $3750. Vintage Mason and Hamlin 6 foot artist grand gorgeous rich tone! Vintage mahogany cabinet. No cracks in soundboard original ivory keys awesome by for a player! New retail price $71,400! 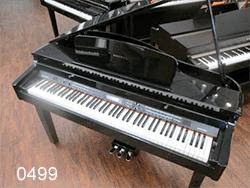 You can only use piano for only $4725. Kranich & Bach model C141, 4’8” baby grand piano, built by Baldwin. Serial #48124. Very nice condition inside and out. Perfect size for your living room, plays and sounds great! Includes matching bench. In our Louisville, KY showroom. Vintage Shomacker grand piano in mahogany. Restored and refinished. 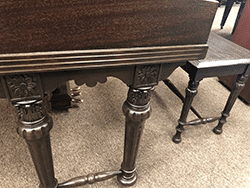 This piano has a deep rich tone and original matching bench. 1992 Samick model SU143F console piano. Very good condition. Beautiful French Provincial Cherry cabinet. Tuned, serviced and ready to play! Includes matching bench. 2011 Ritmuller model UP117M1, 46” studio piano. Very good condition. Plays and sounds great! Very clean and well maintained. One owner. Includes matching bench. In a Beautiful Satin Cherry Finish. This Piano would be Great for Church, Studio or Home. Comes with Matching Bench and full New Factory 10 year Warranty. Regular Price $7995.00 Christmas Sale Price $6692.00 This is very hard to find in this Finish!!! Come in and see and play to appreciate!!! One Owner Since New and is in "TRIPLE MINT" Condition. This Piano comes with Matching Bench and a Full 5 Year Warranty. Pianos Finish is Flawless and Looks as "NEW". If this were new today it would Retail for in the $6495.00 Range. This one can be yours for Only $2995.00 and just in Time for a Great Christmas Gift for the Family. 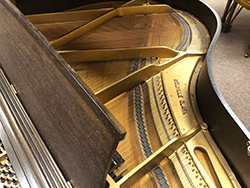 If you're wanting the Perfect Piano, Don't Wait. None Better or nicer in the Store. Piano comes with matching bench and plays fine. 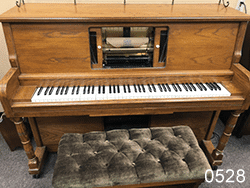 This is a "REAL BARGIN" at only $795.00 Just in time for that first starter Piano. Hurry in!!! will Go Fast!!! Yamaha U-1 Pro Studio Piano in "TRIPLE MINT" condition. This piano is flawless in every way and plays as BRAND NEW. Comes with matching bench and original factory papers. A New U-1 Studio list at $12000.00 This one can be purchased for only $7495.00 and comes with a full Warranty. This piano will go quick so don't Delay!!!! This is a Yamaha Disklavier Player Grand Piano. Made in Japan. Model GC1 Piano will have all upgrades on player system with memory and CD. 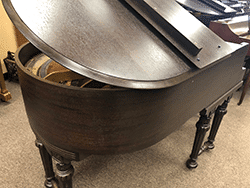 Piano is in "MINT" condition and looks and plays as "NEW" In high polish ebony finish and comes with matching bench and warranty. If new this piano retails at $38,000. This one can be purchased for only $15,999. If you're in the market for the perfect player grand, don't wait as these are very rare and hard to find. Great entertainment for your home and parties. “NEW” Ritmuller UP110RB 43” console piano with matching bench. Beautiful French Provincial Cherry cabinet. Plays and sounds great! Includes 10 year parts & labor warranty. Winter & Company 5’0” grand piano with matching bench. Serial # 270163 built in New York in 1950. This piano plays, sounds and looks great, and would be a good choice for casual home entertainment. This piano is in "TRIPLE MINT" Condition. Piano is in a flawless High Polish Dark Walnut Finish and come with Matching Bench and warranty. Made in U.S.A. and is considered one of the finest pianos made today. 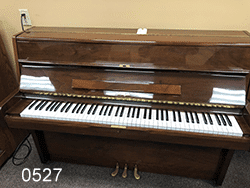 If new this piano would retail at around $7295.00 This one can be purchased for only $3295.00 and is as Good as Brand New. Great for Church Home or Studio use. Hurry in as this will sell Very Fast!!!! 1989 Kimball model 414R console piano with matching bench. Very nice condition. Built in the USA. Great choice for home, beginner or advanced player. 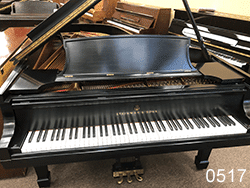 This Piano is in a satin ebony finish and is in excellent condition. 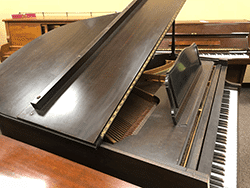 This piano is conservatory grade and would be great for any church, studio or home. Comes with bench and 5 year warranty. If this piano were new today it would sell for in a $55,000 range. This one can be yours for only $15,995 HURRY IN, Will sell very fast!!!! This is a "NEW" Kawai Model GL-20 Grand Piano in High Polish Ebony Finish. 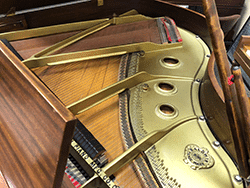 This piano has the very Best in components such as Solid Spruce sound Board along with Duplex Scale design. Millennium 3 Action and with full Sostenuto Pedal. Slow close Fall board. This would be a Fine addition to Home or Church or Studio use. 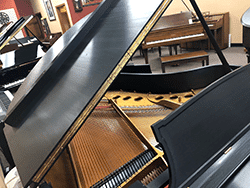 Retail Price $19,900.00 SALE PRICE $12,975.00 Come in and see why Kawai Grand Pianos are the First Choice of so many Professional Musicians!!! This is a "NEW" Kawai Decorator Console Piano. This piano has Beautiful appointments in Looks and style. 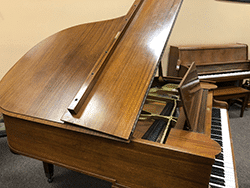 Piano features Ultra Responsive Direct Blow action as well as solid spruce sound board and 5 Post construction for long life and durability Comes with Matching Bench and 10 year warranty. 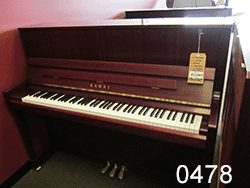 Retail Priced at $6495.00 SALE PRICED AT $4495.00 Come in soon and play a NEW KAWAI, you'll be glad you did!!! Yamaha 5'3 Grand model GP-1 with duplex scale. This Piano is flawless and looks and plays as "BRAND NEW". In high Polish Ebony finish and comes with matching Bench and 5 year Warranty. This would be perfect for Church or Home or Studio. If new would sell for $24,000. This one can be purchased for only $10,900. Will go very fast, Don't Delay!!! This is The "NEW" Kawai Designer console piano Model 607 This Piano features Ultra Responsive Direct Blow Action with 5 back post construction solid spruce sound board and will satisfy the most demanding musician for sound and Quality. Comes in Queen Anne or French Provincial cabinets. This Piano Retails at $7495.00 SALE PRICED AT $5899.00. This piano would make a beautiful addition to any Home!!! 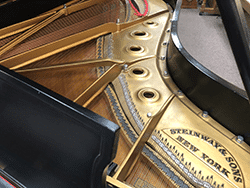 This is the "NEW" Kawai Institutional Studio piano Model UST-9 This piano features Locking Lid and Fall board as well as Millennium 3 Action 5 Post construction frame and double wheel casters for easy moving. 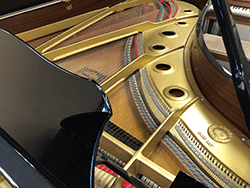 Piano comes in a variety of finish options like Satin Oak Satin Cherry and satin ebony. Retail priced at $7995.00 SALE PRICED AT $5990.00 Perfect for School, Church or Home use where ever Great sound and Reliability are needed. In "TRIPLE MINT" Condition. Made in Japan, Piano Looks and Plays as "BRAND NEW" and comes with Matching Bench and warranty. These Pianos are getting Harder and Harder to come by. A new one would Retail at around $18,995. This one can be Purchased for only $10,900. so hurry in before it's Gone!!!! This is a "NEW" Kawai K-300 Pro Studio Piano. This Piano is quiet possibly the Finest engineered Professional Studio piano made. Piano features Millennium 3 Action with solid spruce Sound Board 5 Back post construction frame with double felted hammers for long life and durability. This Piano would make a Great selection for Church Studio or home use. Retail Priced at $10,995.00 SALE PRICED at $8595.00 Come in soon and be amazed at the sound Quality and Touch this Piano delivers. Piano plays and looks in very good condition. This would be an excellent piano for the starting piano player. Piano comes with matching bench and made in the U.S.A. Built in Cincinnati Ohio. A great buy at only $795. Piano sounds terrific. Hurry in will sell very soon!!! Piano has it all with all different sounds and Background Rhythms. Comes with matching Bench and New Warranty. Sale Priced at only $3695.00 Great for any Kind Studio Home or Church Use. This will sell very Fast so Hurry In and $ave Now!! Piano is in excellent condition. Comes with matching bench and warranty. 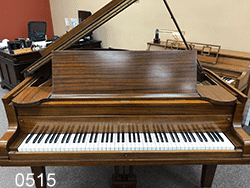 Great starter piano and for only $1595. 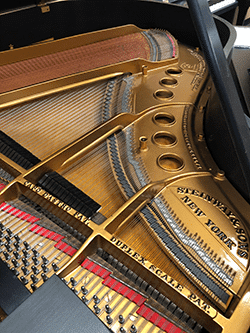 This piano plays as good as it looks and made in U.S.A. These good pianos are getting harder and harder to find in a low price range like this. Come in soon!! Model DGB1, built in 2007. Like new condition. Playback music via "CD" or "Floppy Disk". Over 250 songs "pre-loaded" into memory. Plays and sounds great. 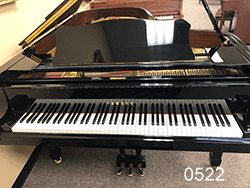 Comparable new piano is over $25,000.00. Hurry, this one won't last! In "MINT CONDITION" piano looks and plays as "NEW". This piano comes with Matching Bench and Warranty. A New piano Like this would cost around $5995. This one can be purchased for only $2695. Great for church home or studio use. Won't last long, hurry in!!!! In "LIKE NEW" condition. Piano plays and sounds as "NEW". 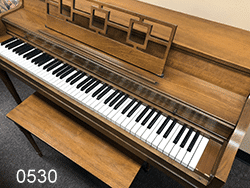 A New Console piano goes for around $4500.00 and More these Days. This one can be yours for $1595.00 and comes with Matching Bench and Warranty. A Great Starter Piano or for Small Church. Yamaha model P2, 45” studio piano. Built in Japan. This is an earlier version of the famous Yamaha model P22 studio piano, shows some signs of wear but in good overall condition. his is a Vintage Yamaha Piano in a flawless Light walnut finish with matching bench. This Piano Plays and looks like "NEW" This would make a Great Starter Piano and would last a lifetime. Just in time for Christmas at a Price of only $1595.00 Also comes with warranty. This will go very fast so hurry in and $ave on this one. This is a Young Chang model AF-106 Console piano in "MINT" Condition in a Dark Cherry Queen anne Finish. Piano plays as "NEW" and comes with a Matching Bench and 5 Year Warranty. If your looking for a Perfect first time Piano This is it!! A new piano of this Quality would cost $6000.00 or more. This one can be purchased for only $2295.00 This would be Great for Church as well. Will sell very fast So don't Delay!!! Piano looks and plays GREAT!! Includes matching bench and warranty. This would be a terrific starter piano for home or church with a budget to work with. Priced at only $1195. Hurry in on this one. "Retro" Kohler & Campbell console in light walnut. Plays good & holds tune good. "Internet Special" Price ONLY $795 with FREE Delivery!